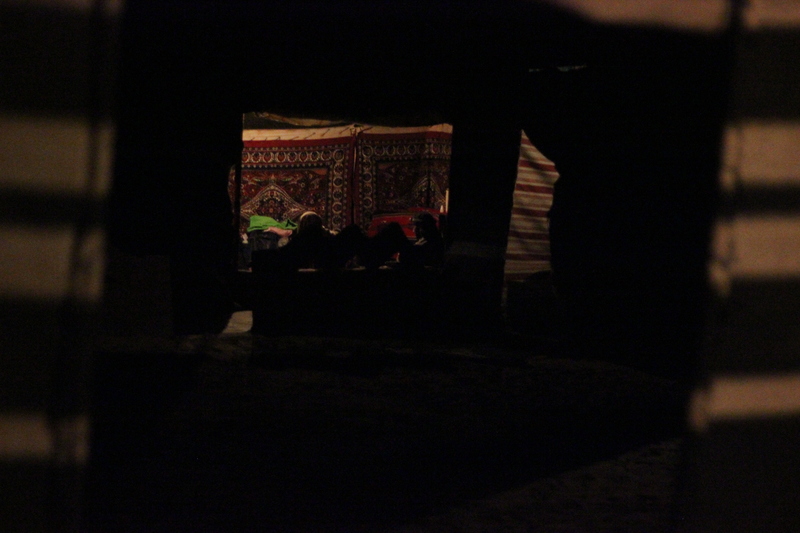 It is already dark when we finally arrive at the Bedouin camp compound. Five small sleeping tents and a communal area form one square section of the compound with all their entrances facing inwards so that it creates an intimate courtyard in the centre. The toilet facilities and the kitchen are on the other end of the section. It’s a small and cozy site surrounded by rock hills all around. There are already a few tourists gathered in the communal area listening to the Bedouin music played by three musicians. I take my shoes off and sit myself on one of the cushions sprawled along side the edge of the wall. There are two or three couples, and one German family. Everyone keeps to themselves and not much conversation is happening. I have no access to electricity for the three days of stay in the desert which means no unnecessarily playing with my phone.The light bulb attached to the ceiling is a little too dim to do any reading or writing. For the first time in my travels alone in Jordan, I’m bored and I don’t know what to do with myself. The dinner is served – chicken and vegetables cooked in underground oven – which is plain and is only seasoned with salt. All the Bedouin guides wait till all their customers have taken their plateful of food, and while we eat our dinner in silence, they discretely take their share and eat outside. After dinner there is more music. One of the Bedouins in a white robe gets up and dance, and we all sit there and watch him. It takes a good effort for him to persuade another English tourist to get up and dance with him, and another good 10 minutes to get another (also English) to join them. The rest of us smile dutifully and clap along, but no matter how jovial the rhythm of the music is, the Westerners remain rigid and unparticipating. Enough of this awkwardness. As I am about to walk out the communal area, a young Bedouin stops me and says hello, which seems to be the very first verbal interaction between a tourist and a local in the evening on the compound. By the time I come out of shower and come back to the tent, the whole compound is quiet. Mahdi had said that I could ask one of the guides to show me a good spot in the desert to sleep outside, but there are no Bedouins to be seen. All lights are off and everybody seems to be sleeping inside. Not wanting to end the day quite yet, I sit a few meters away from the sleeping tents and look up at the sky. The compound is surrounded by walls of high rocks so the sky is the only view that is granted to me right now. “Hello.” Out of nowhere a Bedouin with his headscarf loosely wrapped his head around approaches me. It’s Ayaan, one of the musicians that had talked to me earlier in the evening. He has his sleeping mattress and places it next to my sitting spot. “Oh, is this where you usually sleep? I’m so sorry, I didn’t know. I just wanted to look at the sky here.” I say naively, thinking it is an odd place to sleep, so close to the toilet and without any privacy. “It’s ok. Sit next to me so I can talk to you.” He gestures to the spot next to him on the mat. “I just wanted to look at the stars.’ I reply staying put where I am. It’s a dilemma. My two inner voices fiercely arguing with each other – The Sensible reminds me of all the advices on travel websites not to venture into the desert night alone with a man, even if he is an official guide of a sizeable tour company. The Curious has no reasonable counter argument, but fills my head with an obsessive plea, ‘But I want to see! But I want to see!’. Naturally, The Curious wins and I accept his offer. “None of my friends know I am here. Maybe you shouldn’t tell Mahdi that you were with me here tonight.” Ayaan suggests as he guides me out of the safe walls of the Bedouin compound. The moment we climb onto a higher pane, a magnificent view of the vast desert land unrolls before my eyes. Black, solemn mountains at the backdrop of a silent sky, and the sandy ground with its light blue hue illuminated by the radiant moonlight in its full silver glory. I cannot help but gasp at this mesmerizing sight. I nod, speechless. If I squint hard enough to block out the moonlight, I can just about make out the milky way and the occasional shooting stars. He leads me further away from the camp and I follow him like a girl enchanted. I can feel the soft sand between my toes and the crisp night air on my skin but it feels like I am standing on a land that doesn’t exist – it’s just too beautiful to be true. I haven’t a faintest idea that this night is about to get even more surreal. We sit at the nearby rock, and Ayaan teaches me a couple of Bedouin games played with small rocks. We tell riddles and sing our own traditional songs to each other. Ayaan gathers some firewood and lights a small fire, and we listen to the desert foxes squeak in the far distance. “You see this foot print on the sand? This is of the eagles. And the ones that look like this,” says Ayaan making a hoof mark with his fingers on the ground, “is of a camel”. He goes on making various footprints of various desert creatures, and I recreate them with my fingers. I tell him I want to see the desert fox, so he goes back to the camp and brings some left over cheese. We leave it out some distance away from us so that the foxes won’t be scared by our presence, blow out the fire and wait in silence and stillness. Ayaan keeps his eyes fixed into the distant mountains, his dark curly hair falling just short of his broad shoulders. The foxes do not come, and we resort back to talking. We are now both subdued by the tranquility of the night and the stillness we have just been dwelling in, and our voices grow softer and gentler. “I give you a Bedouin name. I call you Gomar. It means, Moon.” He whispers, stroking my long wavy hair, tousled and still moist from the shower. “Gomar..” I repeat after him, looking at the full moon hanging above us. He leans in for a kiss, and I move away from him and shake my head to tell him no. Perhaps it was my cue to call it a night and go back to the tent but I don’t. The serenity of the night in Wadi Rum is intoxicating, and I dare not break away from it. Ayaan shifts his position and lies behind me, so that I have to twist my waist to my right in order to talk to him. I was sitting a meter away from him 20 minutes ago, and I cannot remember how we ended up sitting so close. I can feel his waistbone hard on my back and I shuffle forward to create some distance . “Awal, thani, thalith, rabe’h…” He starts counting in Arabic and I follow after him. Never before had another language sound so exotic in my ears. Again I feel something hard on my back – he has moved closer to me – so I shuffle forward again. “Khamis, saadiss, saabe’h, thaamin…” Ayaan recites, his voice growing even more gentler. And again, something hard pressing against my back. Without much thought I turn around to look behind me. I look. I look with an odd determination to remember the sight clearly so that I do not tell myself later that I had imagined all this. The spell of the desert night is horrendously shattered, and I can feel my anger rising up, stifling my breath. Without another word, I turn around and walk away. I fear that I will not be able to find my way back to the camp amongst all these rock mountains but there’s no room for such worries now. ‘Gomar! !’ He stands up and calls after me, but only once and no more. I do not look back, nor does he come after me.